Summer’s a good time to tackle home improvement projects that will look great, but also save energy. 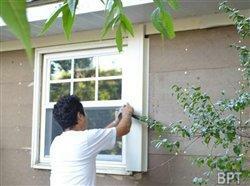 Window replacement is one project that will help increase the energy efficiency of your home and improve curb appeal. There are often telltale signs a home may be in need of new windows, including air leakage, difficulty operating, condensation between glass panes, or exterior paint peeling. Homeowners can check for signs of disrepair by visiting each window and testing operation, checking for air leaks and water collection. What do I need to know about lead paint? Due to the risk lead paint poses, the United States Environmental Protection Agency (EPA) developed the Lead-Based Paint Renovation, Repair and Painting Program to help protect homeowners. This program requires contractors and personnel be trained to use lead-safe work practices. When meeting with a contractor, homeowners should ask for an EPA certificate. At least one certified contractor needs to be on the job site, with a valid certificate, if a home was built before 1978 and contains lead-based paint. The window industry measures the energy efficiency of windows using two methods, U-factor or Solar Heat Gain Coefficient (SHGC). U-factor, or thermal transmission, measures how well a window prevents heat from escaping. SHGC, or “shading” factor, measures how well a window prevents sun glare and heat from entering the home. The lower the U-factor, the better the window prevents energy loss, and the lower the SHGC, the better shading properties it has. Look for windows that meet ENERGY STARrequirements in your climate region, available on www.energystar.gov. Replacement windows with double or triple glazing are another consideration. Double- or triple-glazed windows reduce the amount of energy escaping from the home, and help keep the home cool in summer months and warm in winter months. Can I match the design of my windows to my house style? There are numerous window style options that complement the design of any home. Key elements to consider are operating style and grille pattern. Single or double hung operating styles are ideal for most homes, but casement, awning or architectural shapes can provide visual interest, depending on the house style. Consider grille patterns to give plain glass character. I don’t want white or beige windows. What are some other color options? Today’s options have grown to include a range of light and dark hues for window exteriors, as well as a variety of solid colors and wood grains to match the interior design. Homeowners now can choose from a variety of options to enhance curb appeal and existing architecture. Windows such as Ply Gem Windows Mira Premium Series offer homeowners a range of color options beyond white and beige, including the new Radiance series, featuring hues such as black cherry, sunset and sapphire ice. Poor installation techniques can reduce the advantages of window replacement and may result in air or water leakage. Ask your contractor if they will be doing a “pocket replacement” or a “full-frame” installation. Using pocket replacement, the contractor will remove the operating sash, but leave the outer frame intact. Full-frame installation removes the entire window down to the rough opening. For both techniques, proper flashing, sealing and insulation help ensure the best performance. To close any gap between the window and frame, low-expanding window and door foam should be used. For even more tips on window replacement, visit www.plygemwindows.com. Proactively developing a checklist of questions to ask your contractor before starting window replacement projects will help reduce stress and ensure you get the correct windows for your home that will last for seasons to come.